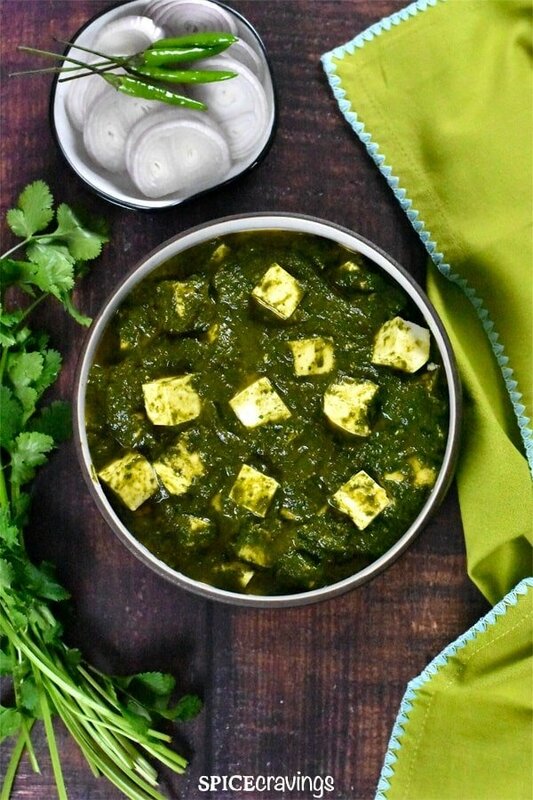 Palak Paneer, or Saag Paneer, is a popular north-Indian curry made by simmering soft paneer cubes (Indian cottage cheese), in a flavorful spinach gravy. Try this simple one-pot recipe and enjoy this vegetarian restaurant favorite in under 30 minutes. Traditionally, Palak Paneer is made with large spinach leaves, that come in bunches. They are dark green in color and have an earthy taste. In this recipe, I take a shortcut and use pre-washed baby spinach. The taste is phenomenal, and I save myself the time it takes to triple wash the large spinach bunch. This recipe can also work with frozen spinach, but in my opinion, fresh spinach makes a tastier curry. 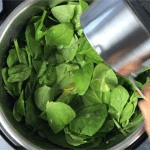 If using frozen spinach, increase the pressure cooking time to 1 minute. This is my mom’s family-famous recipe! 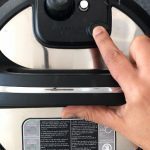 She always makes it on the stove, but I have adapted it to my pressure cooker, Instant Pot, to make this more hands-off, with minimum baby-sitting. These two recipe names confuse a lot of people. Even though restaurants use these names interchangeably, there is a small difference between the two. 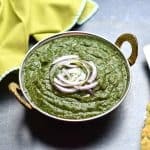 Saag, refers to a variety of green leafy vegetables, including Spinach (called Palak in Hindi), Mustard Greens, Fenugreek, Collard Greens, and other similar varieties. The availability of the kind of greens largely depends on the region and weather. Typically in northern India, Saag refers to a combination of spinach and mustard greens, whereas Palak is the Hindi name for spinach. 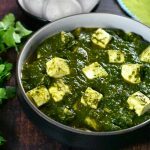 The main difference between the two is that Saag Paneer can be made with any leafy greens or a combination of greens, but, Palak Paneer refers to a curry made with spinach leaves only. As long you match the quantity of the greens to around 10-12 ounces, you can make this recipe with any greens of your choice. Some alternatives that have worked well for me are baby kale or regular kale, mustard greens, a mix of collard greens and spinach. Step 1: Pressure Cook. I start by sautéing the onions, fresh ginger, garlic, chilies for a couple of minutes. Then I add a little water, spices and all the baby spinach. Turn off Saute. Close the lid and pressure cook for ‘0’ minutes. This time was key in retaining the gorgeous color of spinach. What this zero minutes cook time does is essentially steam the vegetables (or anything), in the time it takes to build pressure. This works great for steaming vegetables, or cooking thin filets of fish, without over-cooking them. Step 2: Release Pressure (QR). After pressure cooking is done, and the cooker switches to the ‘keep warm’ mode, I manually release the pressure (QR), by turning the knob to ‘Venting’ position in DUO model, and pushing down the pressure valve in an ULTRA. Step 3: Blend.Using an immersion blender, I blend the spinach till I reach my desired consistency. Add water if needed. Traditionally, this curry has a silky smooth texture, but you can leave it a bit chunky if you like. (you may want to read the section about avoiding spinach splatters while pureeing). Step 4: Add Paneer and Simmer. Turn on Saute on medium setting. The reason we do that is that spinach puree tends to create large bubbles when simmering. They are super tasty, but trust me, you don’t want them landing on your hands 🙂 Add the cubed paneer pieces, a teaspoon of butter, and simmer everything for 1 minute, till the paneer becomes tender. You can make this recipe Vegan by swapping out the paneer with Extra-Firm Tofu. 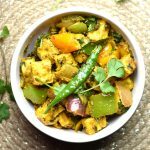 Follow the recipe exactly, just switch out the paneer with cubed tofu pieces. Option#1: Follow the recipe as-is and boil your preferred potatoes separately while the greens are pressure cooking. You can use red potatoes, gold potatoes, fingerling potatoes. Chop the cooked potatoes to about 1/2-3/4 inch in size. Puree the greens and add the chopped potatoes and saute for a few minutes. This allows the potatoes to soak in the flavors. Done! 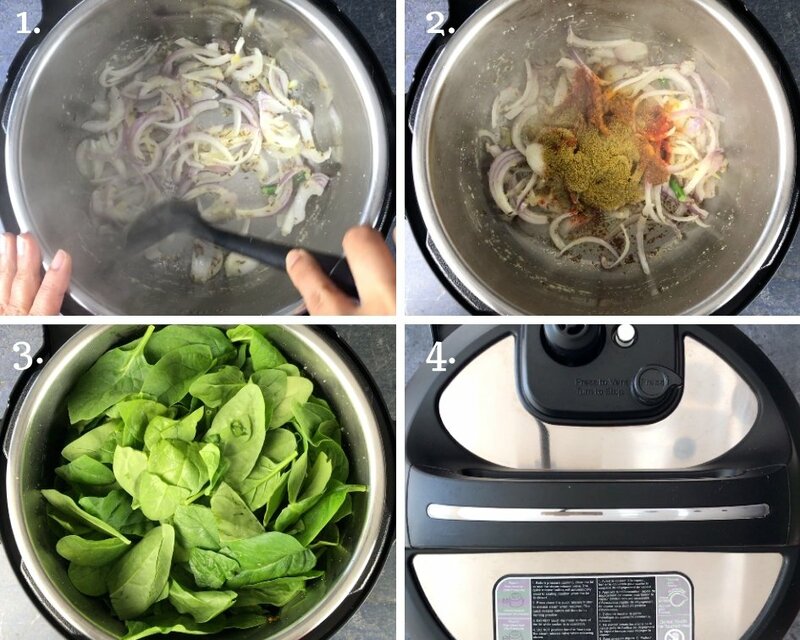 Option#2: Follow the recipe till Step #3 and assemble the greens in the Instant Pot. Peel and chop potatoes of your choice (about 2 cups), in 1/2 inch cubes and toss them with 1/4 tsp salt. Lightly grease a steamer basket and spread the potatoes on it. Place the steamer basket in the pot, close lid and pressure cook for 2 mins. QR and remove the steamer basket. Puree the greens and add the potatoes. Saute for 1-2 mins and enjoy Saag Aloo with Naan or rice! ✅Heat a deep sauce pan on medium high heat. Since spinach puree tends to splash when simmering, using a deep sauce pan prevents it from messing the cooktop. ✅Add oil and cumin seeds. When cumin seeds begin to sizzle, add crushed ginger and garlic. Sliced onion and green chili go in next, sauté for a minute. ✅Add salt, spices and stir well. Then, add 3/4 cup water, stir, cover the pan and cook for about 5-7 minutes on medium heat. ✅Open the lid and add 1/2 bag of baby spinach and stir to wilt, about 2 minutes. Add the remaining spinach and wilt for around 2 minutes. Saute for another 1 minute. Turn off the heat. Using a hand blender puree the spinach mix. ✅Turn the heat back on to medium, add paneer cubes and simmer for 1 min, till paneer cubes become soft. Turn off the heat. Stir in butter, this adds a silky smooth finish to the sauce, and gives it a gorgeous shine. Hand Blenders are great when you want to puree a sauce and get a velvety smooth finish. But, unless the quantity is enough to submerge the blender-head in the sauce, they tend to splash the sauce all over. To avoid that, I tilt the pot a bit till the blender is completely submerged in sauce and that does the trick. Alternatively, I transfer the spinach mix to a tall measuring cup, or the jar that came with my hand blender set. I puree the spinach in that and there are no splashes at all. 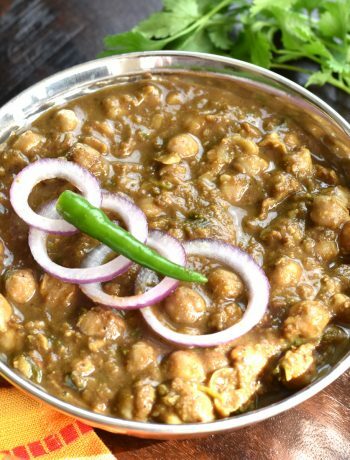 Enjoy a Delicious Indian Vegetarian Meal! 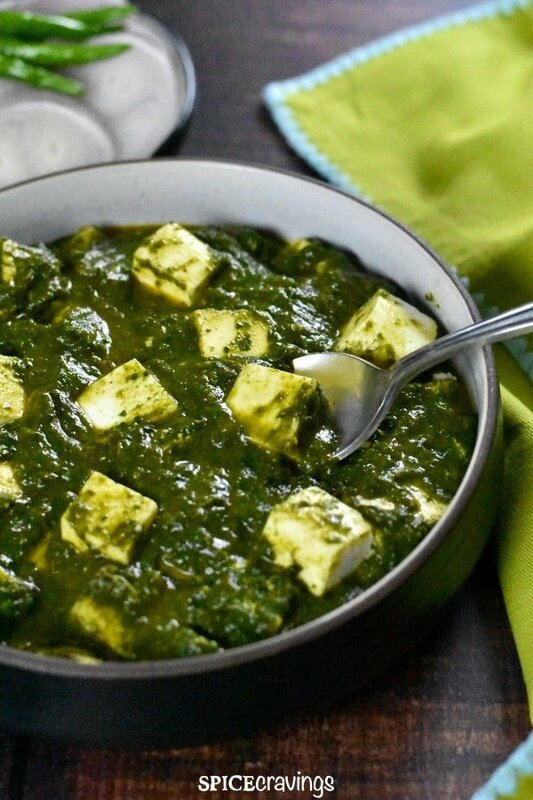 Here are some popular pairings with Palak Paneer. Usually, we have Palak Paneer with Cumin Basmati Rice or Naan. You can pair it with Brown Jasmine rice as well. One of my favorite comfort meals is Palak Paneer with Dal Tadka , Cumin Rice and Cucumber Raita. It’s one of those meals that I long for when I’ve been away from home traveling. 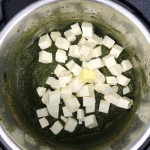 30-minute Instant Pot recipe for Palak Paneer, or Saag Paneer, a popular Indian curry made with soft paneer cubes simmered in a flavorful spinach gravy. Prep: Coarsely chop or slice onions, ginger and garlic. Chop paneer cubes in 1/2 inch cubes. Wash the baby spinach, if not pre-washed. Turn on the Instant Pot on SAUTE (high). When it displays ‘hot’, add oil and cumin seeds. When cumin seeds begin to sizzle, add onions, ginger, garlic, chili, and sauté for about 1 minute, till onions turn translucent. Add salt and spices and stir well. Add 1/2 cup water and use it to deglaze the pot. Add baby spinach with 1/2 cup water and close the lid. Hit ‘cancel’ and set pressure valve to SEALING position. Cook on Manual or Pressure cook for 0 minutes. After pressure cooking is done, release the pressure manually (QR). Using an immersion blender, puree the spinach mix. If the quantity is less for blending, tilt the pot a bit. Turn on SAUTE (medium). Stir in paneer cubes and simmer for 1 minute, till paneer cubes become soft. Turn off the Instant Pot. Stir in butter. This adds a silky smooth finish to the sauce, and gives it a gorgeous shine. Serve hot with cumin rice or naan. Enjoy! Heat a deep sauce pan on medium high heat. Since spinach puree tends to splash when simmering, using a deep sauce pan prevents it from messing the cooktop. Add oil and cumin seeds. When cumin seeds begin to sizzle, add crushed ginger and garlic. Add sliced onion and green chili, and sauté for a minute. Add salt, spices and stir well. Then, add 3/4 cup water, stir, cover the pan and cook for about 5-7 minutes on medium heat. Open the lid and add 1/2 bag of baby spinach and stir to wilt, about 2 minutes. Add the remaining spinach and wilt for around 2 minutes. Saute for another 1 minute. Turn off the heat. Using a hand blender puree the spinach mix. Add a little water if needed. Turn the heat back on to medium, add paneer cubes and simmer for 1 min, till paneer cubes become soft. Turn off the heat. Stir in butter, this adds a silky smooth finish to the sauce, and gives it a gorgeous shine. Note: This recipe has been tested in 3qt and 6 qt Instant Pot DUO and ULTRA models. Estimated Total time: Prep: 10 mins, Saute: 2-3 mins, Pressure Build-up time: 10 mins +/-, Pressure Cooking Time: 0 mins, Saute: 1 min, Total time: 25 mins. Recipe updated in February 2019 to make it a one-pot recipe. ❤️ For more Quick & Easy recipes, JOIN ME on Facebook, Instagram, Youtube and Pinterest. I am excited to make this tonight! Do you know how I could add potatoes to it? This is my first time using my IP! Hi Lindsey, My apologies for the late reply, I was traveling so missed your comment. Potatoes sounds like a delicious combination in this dish. I would add the cubed potatoes and pressure cook them with the tomato onion mix. Then, remove the potatoes and keep aside. Add the spinach and follow the pureeing step and add the potatoes back in the dish. Would love to hear how you like it! I’m so delighted I discovered your page through the Instant Pot group! My eyes lit up when I saw Palak Paneer —- a favorite of mine. BUT – I’ve always had the version WITHOUT tomato – and finished off with a fair amount of CREAM – so it is very creamy. After many trials, I finally found a recipe that was ‘almost’what I remembered enjoying in the Haveli Restaurant in Houston, TX. I did discover that one thing that added a ‘familiar’ flavor was the chick pea flour that was used as a flavoring and slight thickening. I remember it had cinnamon stick and cardamon pods. I don’t remember much of a cumin flavor, but there was fresh ginger and probably a little garlic. Is there any way that you might be able to find a recipe that is similar? I’ll be doing flip flops over my Instant Pot if you can suggest a recipe that might work! ;D Meanwhile, I’ve signed up for your newsletter and really looking forward to it! Thanks! Thank you for your kind words Linda, I am so glad you like my blog. Hope my recipes go above and beyond your expectations! The dish and flavors you’re describing sounds like a restaurant variation of Saag- Spiced Mustard Greens, and I do have a recipe for that 🙂 Here it is: https://spicecravings.com/sarson-ka-saag-spiced-mustard-greens. You’ll see that there is no tomato in that, the seasoning is Garam masala and coriander powder and I use fine ground cornmeal to thicken it, but you can toast some chickpea flour and use that too. The cream is a restaurant addition to this recipe, so you can add 1/4 cup towards the end and adjust the creaminess to your taste. Hope this helps- would love to hear how you like it! Thank you soooo very much for your reply and the recipe! 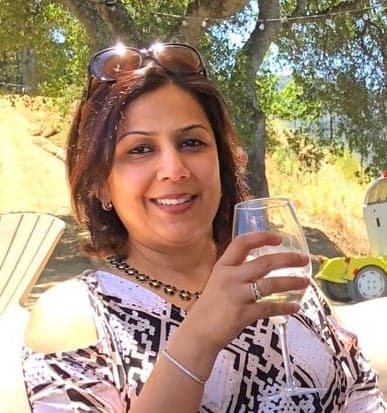 I can hardly wait to get to the grocery store and get some ‘greens’ – and probably some paneer. My paneer never firms up so it will stay cut in cubes, when I make it. Any suggestions? Thanks again!!! You’re welcome Linda! Hope you love it! With paneer, if it’s not setting, it’s probably not drained well. I have recently started using a “tofu Press” and that works well. It’s <$10 and does the job of draining and setting the paneer. I git it from Amazon incase you want to look it up! I’ll check amazon now. Thanks for the tip! 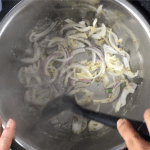 Paneer is so easy to make…. but I guess if I can’t make it to ‘cube’, I can always rinse it well and add it at the end like cottage cheese…… which makes me wonder…. if I don’t have paneer, couldn’t I rinse large curd cottage cheese very well and add it just before serving? Thanks again. I’ve never tried using cottage cheese in this recipe, so can’t say. If you do try it out, would love to hear how it worked out.